As a foreigner(Scot) in a strange land(USA), I was initially annoyed by people trying to copy my accent, and even more so when they asked me if I was Australian, Irish, South African, or Scotch-Irish. (Which doesn’t exist outside of the US) Now I laugh it off… and tell them their accent is hopeless. For some folks, it could be difficult to distinguish between Scottish and Irish accents, and hence it would be even more awkward or off-putting if the mimic of accent veers precariously or uncharacteristically from one accent to another. The lunar New Year is celebrated for 16 days, during which citruses, especially the mandarin (to be eaten as a fruit as well as spoken as a language), are in very high demand. Thanks SoundEagle for such an informative comment. I certainly didn’t know that about the Chinese and their attitude to certain types of mimicry. On the whole, it’s perhaps wiser to steer clear of mimicking others accents if it might cause offence. I think the only way it is acceptable is if you know the other person/s well enough to know that they are ok with it. Or, if you are at an event where you know that that is likely to occur, such as a comedy event. And even then, it does depend on the material – not everyone is able to laugh at themselves and perhaps for good reason. What are you doing up? Isn’t it bedtime in Australia? Wishing that there’s not the need to sleep anymore . . . . . The lean, mean, clean, preened machine that is SoundEagle? It seems that you have been there but have neither liked nor commented. I frequently get accents wrong. I have confused Spanish for Russian and Iranian and recently Balkan. Funny thing, I’m Latino. So accents to me are in a world of their own. Thank you Pablo. I, like you, frequently do this. Most people I speak to (whether I get it wrong or not) are happy to speak with me and share a little about their culture which makes it fun getting to know others. I grew up in NYC which is a melting pot. Accents there abound. I think, however, the attitude toward accents has changed over the years. When I was a girl, humor featuring accents was common. Comedian Bill Dana played a dim but lovable character (Jose Jimenez) w/ a thick Hispanic accent. “The Education of Hyman Kaplan” by Leo Rosten was recommended reading for school children. The popular TV program “The Big Bang Theory” still capitalizes on accents, most especially those of the characters Raj Koothrappali and Mrs. Wolowitz (now deceased). Today, however, many people take offense if others attempt to imitate them. Ethnic humor — except by those who share the ethnicity — is no longer acceptable. People feel belittled and stereotyped by it. Even the Mark Twain classic “The Adventures of Huckleberry Finn” (a study in racism which features accents) is handled w/ extreme care in schools. You may use accents in a spirit of friendship and fun. But your intentions are likely to be misunderstood. Thank you Anna. Yes, you make very insightful comments on the way attitudes have changed towards accents over the years. I, too, remember as a child being annoyed and embarrassed about the way certain television programmes made fun of non-British accents, but I suppose as I got older I began to relax a little about it and can find it quite funny if it is done in a non-malicious way. I would never in a professional capacity mimic someone I had only just met though, and tend to indulge in banter of that nature in an intuitive way. And I think if there is an understanding and it’s mutually done, people tend not to be offended. I think it’s wise to be sensitive to others feelings where upset might be caused though. I agree with your excellent comment in general, though I also mentioned in an earlier comment to Val Boyko and Marie that the reception or response to someone mimicking accents may also depend on the situation, culture, race, language and occasion. 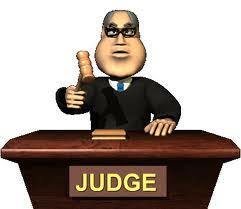 It just dawns on SoundEagle that both of our latest posts, yours here and mine at https://soundeagle.wordpress.com/2017/10/18/the-quotation-fallacy/ contain, right from the start, an image of a judge presiding over some matter in court! No. Where is the mention? Happy Lunar New Year to Marie the Moon! Well, were you flattered with what SoundEagle did at https://soundeagle.wordpress.com/2012/10/19/%e2%9d%84-%e2%9d%85-%e2%9d%86-snowflakes-tell-me-why-you-are/ ? Marie the Moon in the Sky raining Snowflakes as SoundEagle flies over the snow amidst the forest and hills . . . . . If you had indeed been to https://soundeagle.wordpress.com/2012/10/19/%e2%9d%84-%e2%9d%85-%e2%9d%86-snowflakes-tell-me-why-you-are/ since the post was recently improved, this is exactly the scene depicted for you to behold. Moreover, the scene is not static as it is enlivened with animation! What a coincidence! Or it could be subconscious synchronization. . . . . . being our latest posts and the first image in the post and a presiding judge . . . . . that’s actually at least three coincidences at once! Hard to judge (ho-ho) at a distance, isn’t it? I think one has to be privy to the psychological, social and emotional context to ascertain whether such speech mimicry is appropriate. It’s easy enough for remote communications direct between two parties to be misinterpreted — e.g. emails, blog comments, etc. — let alone twice removed accounts of others’ conversations. Not sure if context is everything, but it counts for a lot. Thanks for your, as usual, insightful comments and your sense of humour. Personally, I would not take affront to someone trying to mimic my accent. Imitiation is the sincerest form of flattery, unless their words are intentionally nasty. Thank you, agoodlittlegirl. I agree with you – it’s the context in which it is done. Intentionally ‘nasty’ comments will always be offensive, but mutually entertaining banter can be fun. Beloved, thank you for contributing and for making this very valid point – context and intent are key and where would be if we couldn’t poke fun at ourselves, providing we don’t intentionally mean to harm or offend? And I’m sure you do ace that Indian accent 😉 Speaking of accent reminds me of the TV serial “mind your language” that used to telecast way back in 1970’s. I’m a huge fan of Jeremy brown and used to mimic his English speaking skills all the time :P.. Yes, I used to watch the TV series “mind your language” too. It was perhaps the most multicultural TV show of the era. I think intent is the important thing. You love people and their accents. I am sure people understand that. Thank you for your honesty! I speak four languages, but my oral diction is not my strong, and I end up passing for a foreigner almost everywhere. Perhaps you have a facility at certain accents like the Irish one because you once lived there in another life? It could be interesting to explore! And concerning your reflection about whether we should tailor our accent to the person in front of us, well it sounds quite nice to make that person at ease (in the right way!) if she is shy or homesick, but otherwise when two persons are at the same level, I believe each should stick to his true self. But again perhaps in the spirit world there are “facilitators” who are gifted with languages and accents like you, who will make you hear the talk of your interlocutor in your own patois, and vice versa. Thank you very much Erik for sharing your thoughts. I wish I could speak four languages, but I am hopeless. Kudos to you! It’s interesting what you say about ‘past lives’ and accents. I don’t know if that is so with me, but it sounds as if it would be fun to explore. I only wrote this piece in a light-hearted way as a response to my friend’s experience with the judge. I just found it patronising that he should speak to someone he barely knew like that because it didn’t seem to me to be very professional. I think if you are going to try out accents, then it should be in the full knowledge that you won’t be causing any offence – likely that you are on friendly terms with the other and you’re both ok with it. I wouldn’t say that I was at all gifted with languages and accents, Erik, but I do like listening to and finding out about other people. I note what you say about ‘past lives’ and the spirit world – is this something that you know much about? Have you had a past life that you know of and care to share? And by the way, are you Italian? I hope I’m not making assumptions here! Don’t doubt your own gifts, when you have a strong interest for something it’s often related to something within you that demands to be expressed! At the contrary, I love daring assumptions and questions, that’s what allows us to better understand ourselves and life! And never mind when we are wrong. I’ve lived in Lebanon most of my life, but I also am related to Italy and France (so yes, you were right in your assumption), and now live in Switzerland. I’m not an expert or a guru, but I’m a keen observer and I’ve decided six months ago to leave my engineering job and dedicate my life to writing and thinking. So with the additional time I have I can do a lot more! And I’m not anymore forced to live a lie against myself by going to a work I don’t like every day. I’ve written a few pieces about origins and suspected past lives of mine. Don’t feel compelled to read them all, just the ones that arouse your curiosity! I’ve also written a couple of other stories about the theme but I don’t want to drown you! Thank you for your interest and looking forward to read other pieces you’ve written! Thank you so much Erik for sharing with me like this. I am so grateful that you have taken the time to send such a considered reply and for all the links, which I will look at shortly. When I was younger and took a trip to Paris, I had the strongest feeling for a very long time that I had a connection with that country and even (secretly) entertained the idea that I had lived there at one time. This is long before I even knew anything about past lives. I just felt that I had spent time there – and the cobbled streets just resonated with me in a way that I can’t quite explain. I was hopeless in French lessons at school, so I quickly talked myself out of that ‘past life’ connection, but I still have this strong feeling. Where I am going with this is that I completely get you when you speak about Marseilles …. I’d like to know more about you too, have you written pieces you recommend me to read in particular, things that unveil a bit more who you are? I’m glad of having connected with you too! Funnily I also have the same problem with Lebanon. It is my homeland and I love it, I love its mountains and its sea and its history. And yet I struggle and struggle to speak Arabic and people say I speak Arabic like an Armenian, which is not a compliment as you can imagine! And I tell to myself that perhaps one part of my past is related to Lebanon but for a reason or another there is a blockage with that, and that’s why my Arabic skills are so dramatically poor, when I’m rather skilled with other languages. Perhaps it is the same for you with France. It’s something that deserves to be explored I believe! What feeling comes to your mind when you walk in Paris streets? Who could you have been? How does it relate to your present self, to your fears and blockages and traumas? And to the things you love too! If only I could speak other languages, Erik! I would be quite content to speak Arabic like an Armenian! :) But I see what you mean, about blockages and the like. Life is such a huge mystery that we do stumble around in the dark trying to make sense of it all from the limited sources that we are privy to. Some of us are able to connect with spirit and the non-physical plane more than others. And I suppose part of the intrigue and fun is sharing with others how much of a connection you have and vice versa. Yes, I know what you mean! All my writings too are autobiographical in a way. They’re all little pieces adding together to tell a story. I’ve found your about section, so I know a little more about you now and your multiple presence on several blogs too! And I guess how writing is important for you. Don’t worry about depressing me, I’m strong enough to cope with sadness. I will read the texts you advice me to read in due time! Have a good day Marie! Yes, I can see how the references to being Armenian and the fact that your sister sending you street music relating to Istanbul could resonate with you in the way that you describe. Like you said, in a previous comment, Erik, the resonance of something deep within could possibly mean that your soul is trying to connect on a deeper level and sending messages of former spiritual connections. This is fascinating, and I quickly read through the link you sent to get a feel of what you meant. I need to re-read more slowly in due course to get a stronger sense of the story. There might indeed be more than a modicum of ‘truth’ in your tale about being Armenian – I don’t doubt it! Ton beau message m’a fait envie de pleurer. Merci beaucoup d’avoir pris le temps d’écrire de si beaux mots d’amour et d’amitié. Thank you Cheryle for taking the time to comment. I agree wholeheartedly with what you say. Yes of course, every situation is different and discretion is needed when dealing with others where there is likely to be offence taken. And as long as we are sincere and kind, I don’t doubt that others will reflect that. I love accents and I’m also pretty good at identifying them. Interestingly enough, I read somewhere that speakers from the southern area of any region tend to have something of a “twang” to their accent. Be it Australia, South Africa, The Southern US….I’ve even heard that people who live in Southern Italy have a twang compared to people who live in Northern Italy. Oh and please don’t get me started with people trying to bond with you by speaking what they think is your language; especially something as complex as Jamaican Patois. He needed Mystic Marie to school him! Don’t get me wrong, I code switch all the time, but in either case I am comfortable speaking in black Southern dialiect or, as you might say, “The Queen’s English.” LOL!!! But I know when to do which! And how funny about us getting South African/Australian mixed up – they do sound very alike don’t they? Obviously only special people like ‘us’ are able to hear the similarity. Completely with you on ‘ … they be trippin …’ Seriously??!! Your final observation is spot on: It’s essential to know when to do which. The Judge in question ought to be reminded of this. Grace. I have been thinking about this a lot in my own attitude. If love is not easily offended, then the foolish things we tend to do with each other don’t matter. The other person has value, whether they get the “accent” of their attitude right. Great insights Marie. I’m going to use “Am I a Hypocrite and is it time for me to Hypo-quit?” when I catch myself being critical of others, or for that matter myself. I think I’ve noticed offense primarily when the other person is white. Maybe that’s due to the underlying nature of race relations across this earth, but I’m far less offended if the person’s skin color is brown. Thanks Kathy. I’m inclined to agree with you here. And “race relations across this earth”, as you say will always play a huge part in terms of how mimicry is viewed and tolerated. It will in almost all cases be seen as offensive when linked to racism. C’est un si beau message. Merci beaucoup pour vos paroles et vos souhaits aimables et réfléchis. Bien sûr, je souhaite pour vous, tout ce que vous avez souhaité pour moi. We humans can be silly at times. We’ve all done it and I agree, we just have to laugh it off. Judges are human to I wonder how you and your friend would of reacted to see him without the robe then later find out he was a judge…. Thanks for commenting MSW. That’s a good point you make. It wasn’t so much that he was a judge – it was more that he was in a senior/managerial position and this was the very first conversation he had had with her. He did not know her – for all he knew, she could have been a judge too, but not in her robe. To answer your question – the comment would still have been offensive had he not been a judge because I don’t think you can assume that it’s ok to mimic what you think might be someone’s accent/dialect unless you are well acquainted. Patois is not a language. It would’ve been understandable if it was say French, German, Chinese etc – which are established languages. Then it probably would’ve been a compliment. Hi! My email is mariewilliams1810@gmail – email me, please. Accents are interesting no doubt. They carry with them strong connotations for individuality, identity and a story about the place we were born and raised at. Thought, sadly, they have a downsize. They deem people with the “wrong” accent to be less. I wrote about it in my blog if you want to read about that. Thank you so much for taking the time to comment, and for your link which I intend to read as soon as I can. Apologies for not responding sooner, but I’ve been busy trying to catch up with comments. Kind regards. Thank you so much. I appreciate your very kind comment, Mridula.